Best office chair mats prevents scratches and other damage to hardwood floors, and for carpeted surfaces, they spread out the pressure from the chair over the floor’s surface. 1. Open one end of paper clip. 2. Insert paper clip into carpet and pad, pushing down to sub-floor. This DoubleCheck Products Heavy Duty Carpet Chair Mat is made of non-breakable Polycarbonate. It has anchor points making it suitable for carpeted flooring . It should not be used on hard surface floors. It is a lip shaped mat, so when you put the lip portion of the mat under your desk, the carpeting under your desk is protected when you roll your chair under the desk. The mat measures 36″ x 48″ x 1/8″ and the lip area is 20″ wide. The 48″ length includes the lip area. If your desk has legs or a board on either side of the center opening, make sure that the lip area is not wider than the opening so that no part of the desk is sitting on the mat. The 1/8″ thickness means that the mat is suitable for carpeting and padding combinations that are 1/4″ or less thick. It does not have a beveled edge so it could be harder to roll on and off of the mat. This mat is guaranteed not to crack, break, scratch, discolor, or curl under normal use. However, you should not sit office furniture on top of this mat because that could cause the mat to break and could void the warranty. If this mat is too big for your work space, then choose a smaller mat rather than sit furniture on the mat. Since this mat is transparent, it allows the beauty of your carpeting to be seen. This mat is Phthalate free and free from other toxic compounds. The DoubleCheck Products Heavy Duty Carpet Chair Mat is shipped flat so you do not have to unroll it and work to flatten it when it is delivered. This mat is recommended for 1/4″ thick or less carpeted floor. This mat has a lip that will protect the carpeting under your desk. Guaranteed not to crack, break, scratch, discolor, or curl under normal use. Not thick enough to work well on thicker carpeting and padding combination. Does not have a beveled edge, so it could be harder to roll on and off of the mat. This centered lip chair mat is not for desks with off-center desk openings. This Office Marshal Chair Mat has a lip to protect the carpeting under you desk and studs on the bottom to prevent it from slipping without damaging the carpet. It is not intended for hard surface flooring. It is made from Polycarbonate, a rigid and thick plastic that protects your carpeting but is clear enough to allow your carpet to be seen. Polycarbonate is durable, odor free, dirt resistant, sound absorbent, and compatible with under floor heating. It also is more affordable than glass mats. This mat is 36″ x 48″ x 0.4″, and the lip is 11.5 inches deep and 20″ wide. If you will have to sit any furniture on this mat, choose the rectangular mat or a smaller mat because the weight of office furniture could make it crack or break. The 48″ length includes the lip, and the 0.4 thickness means it is thick enough to be used on high pile carpet or a thick carpet and padding combination of up to 0.8″. It is also available in a 30″ x 48″ and a 36″ x 48″ rectangular mat and a 30″ x 48″ lip chair mat. The square edge could make it harder to roll on and off the mat. The Office Marshal Chair Mat is designed to allow your desk chair to roll freely without slipping. This prevents back and leg fatigue. This mat will not crack, break, scratch, curl, or discolor under normal use. The Office Marshal Chair Mat ships rolled so it will have to be flattened when you receive it. This chair mat is recommended for high pile carpet and thick carpet and padding combinations. This mat is clear so your carpet can be seen. Does not have a beveled edge, so it could be harder to roll on and off the mat. This mat is shipped rolled so you will have to flatten it. This mat is not for hard surface flooring. This YOSHIKO Office Desk Chair Mat is for low And medium pile carpets. It has a smooth and a textured side. Reading comments leaves unanswered the issue of whether the smooth or textured side should be placed down. The mat has a lip to protect the flooring underneath the desk. It is made of durable, odorless, BPA-free, phthalate-free PVC with a dull finish. The mat measures 48″ x 36″ x 0.08″. The 48″ length includes the lip. This transparent mat allows your flooring to be seen. It is shipped rolled in a box so you will have to flatten it. The mat is made of durable, odorless, BPA-free, phthalate-free PVC. It is clear so your flooring can be seen. It has a lip to protect the flooring underneath the desk. There were complaints about it rolling and sliding with no mention of which side was down. Some said the mat was too small. This mat is not for carpeting. The Ilyapa Office Chair Mat is a rectangular mat for hard surface flooring that measures 36″ x 48″ x 1/16″. It is also available in a 30″ x 48″ and a 36″ x 48″ lip chair mat and a 30″ x 48″ rectangular chair mat. It has a textured and a smooth side, and there are advocates for both sides of the issue of which side is the bottom. The mat is clear, so your flooring can be seen. It does not have a beveled edge, so it might be hard to roll on and off the mat. The Ilyapa Office Chair Mat is durable, anti-slip, scuff-resistant, easy to clean, and it comes with a one-year warranty. It is shipped flat so you do not have to flatten it. 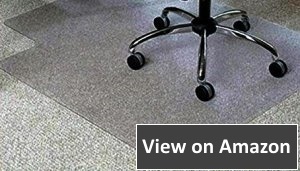 This rectangular mat is recommended for hard surface flooring. The mat is durable, anti-slip, scuff-resistant, easy to clean, and it comes with a one year warranty. It is shipped flat, so you do not have to flatten it. This mat is not meant to be used on carpeting. This mat does not have a beveled edge, so it might be hard to roll on and off the mat. One person said that putting the smooth side down allowed dust and dirt to be trapped under the mat causing it to act like sandpaper, damaging a concrete floor. The Deflecto EconoMat Clear Chair Mat is a rectangular mat for hard surface flooring that measures 46″ x 60″ x 0.075″. It is also available in a 45″ x 53″ lip mat and a 36″ x 48″ rectangular mat. The mat is clear, so your flooring can be seen. This mat has a straight, not a beveled edge. These mats are GREENGUARD Gold Certified for being phthalate-free, BPA-free, and cadmium-free. The mat is shipped rolled, so you will have to weigh it down to unroll it. This mat is recommended for those who need a larger, hard surface flooring mat. These mats are GREENGUARD Gold Certified for being phthalate-free, BPA-free, and cadmium-free. The mat is clear, so your flooring can be seen. 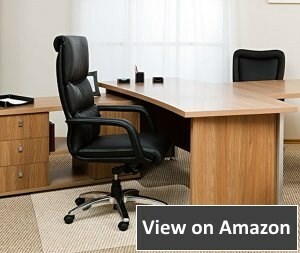 The large size offers more protection for your floor as you move around working at your desk. This mat is not for carpeted surfaces. The mat is shipped rolled, so you will have to weigh it down to unroll it. This mat has a straight, not a beveled edge. 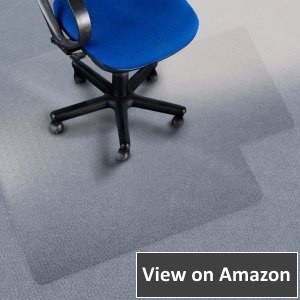 The Mysuntown Polycarbonate Eco Lip Office Chair Mat measures 36″ x 48″ x 0.06″ and is for use on hard surface flooring. It is anti-slip, durable, and easy to clean. The lip protects the floor under your desk, but it is clear so your flooring can be seen. The mat may be shipped rolled so you may have to flatten it. This mat is recommended for small work spaces with hard surface flooring. It is anti-slip, durable, and easy to clean. It is clear, so your flooring can be seen. The lip protects the floor under your desk. It is not for use on carpeting. It may come rolled, so you may have to flatten it. A few customers felt it was too soft and thin. Why Buy a Chair Mat? Buying a chair mat to put beneath you desk chair is essential to protect your flooring and reduce fatigue on your back and legs from moving your chair when you are working at your desk. To accomplish this, you need to choose the right type, size, shape, and thickness for your flooring and your work space. This review contains six recommended chair mats and a buyers guide to help you choose the top chair mat for your work space. Whether you have carpeting, tile, wood, or other hard surface flooring, chair mats extend the life of your floor. The pressure from a chair is 100 times greater than from a footstep. This can cause carpeting to lose fibers and the carpet backing to break down. By spreading out the pressure, chair mats keep carpeting in good shape longer. In fact, many flooring manufacturers void their warranty if you do not use floor mats. Chair mats also reduce fatigue, repetitive stress injuries, and back and leg strain caused by rolling a desk chair around your workspace. During an eight hour workday, an average office worker moves their chair 250 to 300 times. These moves require half as much effort with a chair mat than over a carpeted surface making it easier on your back and legs. Chair mats also protect you from electrical shock and your computer from being damaged by static build up. An anti-static chair mat is chemically treated to disperse static electricity from friction caused by moving around on carpeting. Without an anti-static chair mat, the static electricity could build up in your computer causing you to lose data or causing damage to your computer. 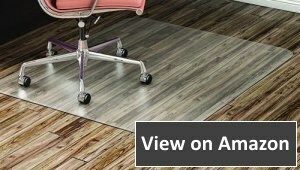 Chair mats for hard surface flooring do not have cleats or anchor points. They have a textured front and back that keeps the mat in place and does not damage the floor. These mats are thinner and have a straight edge. Chair mats for carpeting have cleats or anchor points on the back and a beveled edge. The cleats hold the mat in place without damaging the carpeting. Chair mats for hard surface floors are 1/8″ thick. The thickness of chair mats for carpeting varies depending on the thickness of the carpeting. There is also an economy chair mat that is 1/10″ thick. Thicker chair mats keep chairs from moving when you want them stationary. If you will be using the chair for more than eight hours in a day, or if anyone over 200 pounds will be using the chair, then you need a thicker chair mat. If the chair mat is too thin for the thickness of the carpeting, it will crack and break. The size of the chair mat that you need depends on how large of an area that you cover when you move your chair. If you are just at your desk, then you can use a smaller mat than if you have a file cabinet beside your desk. Measure the size of your actual work area, the area available under your desk, and the base of your chair. Do not buy a large mat that has to be placed under office furniture because the weight of the furniture will cause it to crack and break. Instead, choose the next size smaller mat. Standard size chair mats are 60″x 96″ for hard surfaces and 36” x 48”, 45″ x 53″, 46″ x 60″, 66″ x 60″, and 72” by 96” for carpeted surfaces. Other sizes and custom sizes are also available. Some chair mats have an extension (lip) that goes under the desk. The lip is included in the overall dimensions. Chair mats are available in several shapes including rectangular mats, mats with the lip, contoured mats, and light bulb or fan shaped mats. Rectangular mats are the most common. They can be used with writing tables, desks, u-shaped workstations, l-shaped workstations, corner workstations, and desks with credenza set-ups. Lip chair mats can be used with writing tables, desks, u-shaped workstations, and desks with credenza set-ups. 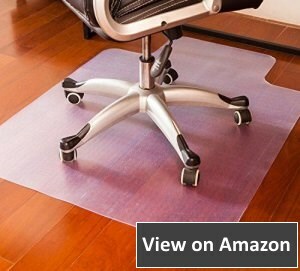 Lip chair mats can not be used with desks that have the leg opening off-center because part of the desk would probably have to be sitting on the mat. Contoured chair mats are similar to rectangular chair mats with one short end slightly curved and the other short end deeply curved. Like rectangular mats, they can be used with any workstation layout. Light bulb mats work well for corner and l-shaped workstations. You can also buy custom-shaped mats. The edges of chair mats are either straight or beveled. Chair mats for hard surface flooring generally have straight edges. Chair mats for carpeting have beveled edges to make it easier to roll on and off the mat. Chair mats are usually clear vinyl that allows the flooring underneath the mat to be visible. Vinyl mats are also available in colors or patterns for a decorative touch. You can also buy chair mats in Plexiglas, glass, wood finish, jute, or sisal. Chair mats are often rolled in a tube shape. To flatten a mat lay it out in the sun, put it near a heat source, or place books or other heavy objects on the edges. It should flatten in a day. If you want to use casters under your chair on the chair mat, use plastic casters. If your rolling office chair has metal wheels, replace them with rubber or plastic wheels. To recap the important buying tips. With these reviews, we have done all the work for you. The six chair mats reviewed are either rectangular or lip chair mats and are designed for either hard surface flooring, thin carpeting, or thick carpeting. So, choose the mat style you want that works with the type of flooring you have, and you will have the chair mat that is best for your work space.